Not just for contact information anymore – business cards are representative of your company’s brand and image. Increase your exposure, boost your sales, and promote your business by having us create your next crisp and clean design. 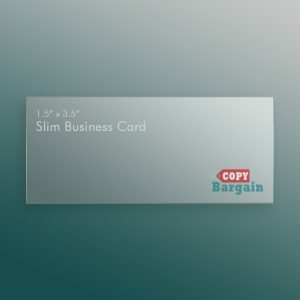 Make a statement with your company by selecting from an assortment of Slim, Standard, Square, or Folded Business Cards to print online. 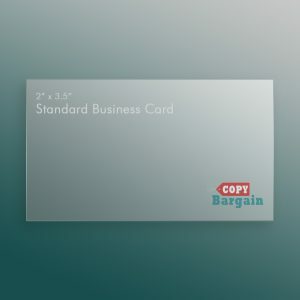 At Copy Bargain, we pride ourselves on excellent customer service, fair prices, and high quality made-to-order online business card printing. If there is one thing that experienced professionals know, it is to always have a stack of business cards on hand. From networking events and sales meetings, to casual events, you can never be sure when someone will need a professional business or visiting card. Unfortunately, those new to their businesses frequently forget the importance of print marketing and wind up empty handed when a potential client or employer asks for a card. Let us help you keep this from happening by choosing to make us your online business card maker. 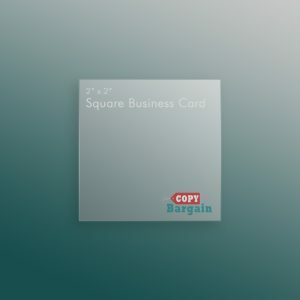 If you want to save money, print online, and choose from some of the best business card designs around, then we are the company for you. At Copy Bargain, we offer convenience, speed, and customer assistance on every order. When you order from us, you can rest assured that you are in the best hands around. We aren’t your average Kinkos or Office Depot. Copy Bargain is made up of professionals across all areas of Internet and print marketing. We know our way around a successful business card and want to help you not only get what you want, but exactly what you need. With exceptional prices, quality assistance, and advice from professional marketers, Copy Bargain offers solutions for your business unlike any other print service around. Whether you need help deciding between any one of our Slim, Standard, Square, and Folded Business Cards, or want the perks of a professionally designed and custom logo, we can help. We go the extra mile to bring you professional service, low prices, and free proof checking to ensure that every print job is exactly to your specifications. 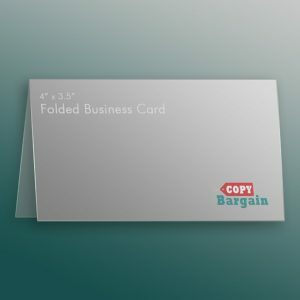 Print online with Copy Bargain and choose from the best business and visiting card designs available. We promise, you won’t be disappointed!